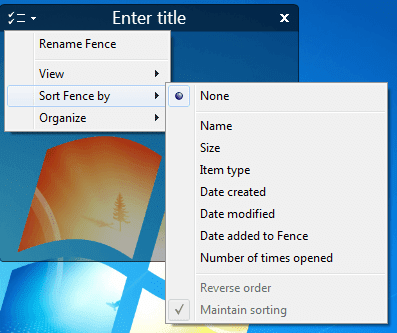 Stardock Fences are designed to reduce or totally removes your desktop clutters. 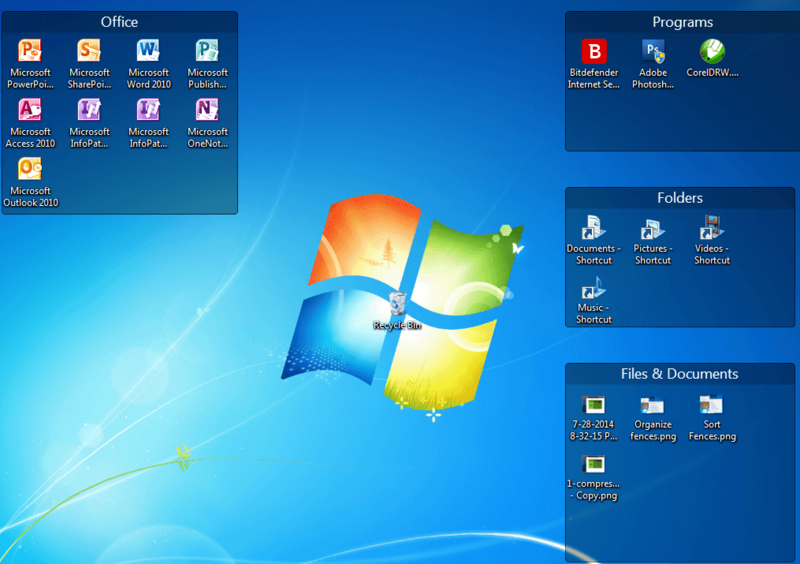 It is a very good tool to organize your computer desktop icons, shortcuts and files. I’ve been using it since then, when it was still free. I’ve got a Stardock Fences v. 1, however, the latest version isn’t free anymore, it is worth $9.99. Now, perhaps, you may ask, “Is it worth it?”. For that matter, let me review it for you and decide later. Download first the Fences installer through the link given below. Then simply run it like any other software, if you installed a previous version of Fences, you have to uninstall it first to install the new version of Fences. Remember to activate it, whether you are using the trial or the paid version. When you fresh install the Fences, right after the installation it will ask you to activate it. Input your email address in the box provided and hit activate. Now check your email and follow the instruction as per provided in the email. There you have it, you just activated your Fences. It’s now ready to organize your desktop. It creates Fences in your Desktop by names. By double clicking the mouse, it can hide and show desktop icons. It can access folder’s contents through Fences on your desktop. It can create Fences pages on your desktop that’s accessible via mouse-swipe. It also automatically arranges icons by names, types and rules you set. The Fences looks are customizable from colors to its looks. On your desktop, hold the right mouse-click, draw a square or rectangle and release it. You will see two options, choose either of the two. 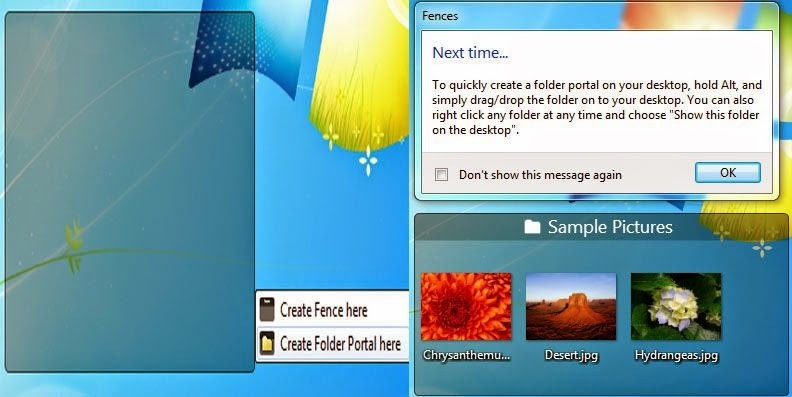 If you want to create a Fence, select “create fence here” or if you prefer to create a Folder Portal, click the “create a folder portal here”. By default, if you double click the mouse on your desktop it will hide all Fences and even those icons outside the Fences. To bring back the icons just double click your mouse again. However, you can set exclusions, by hovering the Fence you want to exclude, right-click your mouse, click the “view” select “exclude this fence from quick-hide”. Aside from that, you can also lock your fences by selecting the “lock fences”. What else? Adjusting your Fences opacity is also part of the options. Folder Portals let’s you access your folder’s files right on your desktop without the need to manually open it. The difference between Fences and Folder Portal is that, Fences holds certain icons, files and folders. On the other hand, Folder Portals display all contents of a certain folder and it automatically updates by itself, whenever a new file is being saved in that particular folder. So, which is better Fences or Folder Portal? They serve different purposes. How to create Fences Pages on your desktop? Fences Pages are sort of making desktop pages, it resembles how you swipe your Android apps in yourSmartphones. It allows you to make another clean desktop that’s accessible via mouse-swipe. To create a Fences Pages, you need to put the mouse cursor at the extreme left of your desktop while holding an icon or a fence. Once the desktop swipes to another desktop, release the fence or icon there to add Fences pages. If you wish to add more Fences pages just repeat the process. You now have two Fences Pages, you can swipe it from left to right or vice-versa using your mouse or the ALT + arrow-left and ALT + arrow-rightwith the use of your keyboard. Fences helps you not just to handle your desktop icons, but to make it easy for you to locate your files and arrange it accordingly. You can sort it by name, size, date created, modified, added and number of times opened. Fences contents can be organized by setting rules. You can create a specific Fence that will handle certain files, the likes of; folders, documents, images, musics, videos, your new downloads, even web links and new program’s shortcuts. 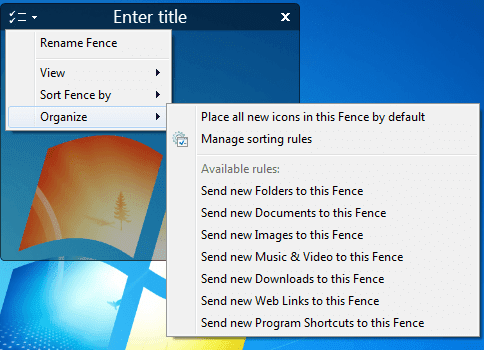 Fences by Stardock will make your desktop more manageable. You will surely enjoy its simple yet rich features . One thing that you can benefit from it aside from organizing your desktop is, you can make another desktop and separate your files there, to avoid anyone from accidentally delete your files on your desktop. If you are concern about your desktop clutters, easy icon organizer with a lot of extra features that can improve your productivity? Stardock Fences is the best for you. So far, I haven’t found anything bad about it except that, if you are using the trial version. You will be prompted by a pop-up reminder about its expiration and a sort of promoting its product, which is normal. Have you tried Stardock Fences 2.13? Share us your experience in the comment box below.